Celtic Alliance black t-shirt with short sleeves, Breton embroidery on the right sleeve and the chest. This classic t-shirt displays some Breton symbols which are discretely embroidered on the right sleeve, the chest and the back. Crew neck, regular fit, short sleeves. Any lover of Brittany will crave for this t-shirt ! Celtic Alliance clothing offers Celtic-themed designs and styles. Both fabrics and cuts are remarkably comfortable and timeless, great for a smart casual look. Celtic Alliance, a brand of Le Comptoir Irlandais, draws inspiration from traditional Celtic woollen sweaters to craft its stylish and classic clothing range. Celtic legends and symbols related to Brittany, Wales, Cornwall, Isle of Man, Scotland and Ireland are featured on the brand’s products. Celtic Alliance developed a broad range of comfortable garments made with easy-care quality fabric. Truly timeless, lambswool sweaters and thick cotton polo sweaters evoke the Celtic nations and show Celtic Alliance’s commitment to values of comfort and quality. Easy to wear at any time of the year, Celtic Alliance clothing may be paired with any outfit and style. As wardrobe classics, the Celtic Alliance products are durable and available in a broad range of colours and materials, as well as being offered in a variety of collections, always bolstered by the Celtic spirit and a continuous research of quality and comfort. 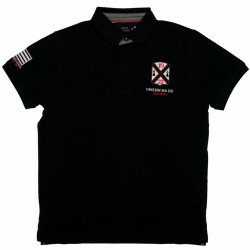 Black short sleeved polo shirt, with Breton symbols (Gwenn Ha Du and ermine) on sleeves and chest.